Back in June, the Ministry of Science and ICT established ‘Blockchain technology development strategy’ with related experts to pursue advanced countries in cooperation with private firms to become a leading blockchain country. 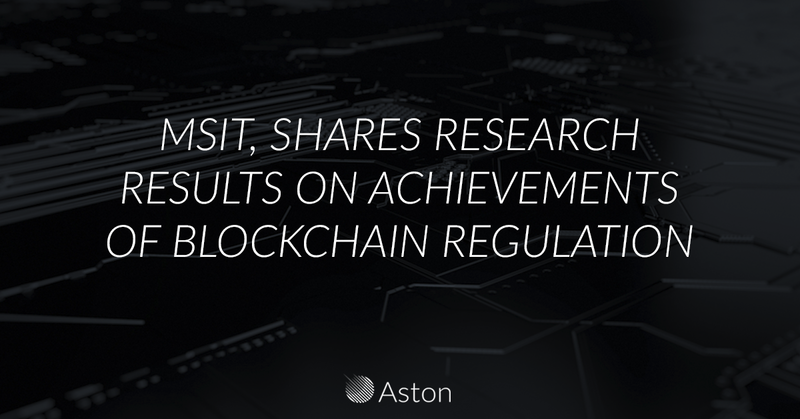 As a part of its follow-ups, a private-firm led the 1st ‘blockchain regulatory improment study group’ was formed and operated to respond to regulatory challenges that block the expansion of blockchain industry across all sectors. At the ‘Blockchain Tech Biz Conference’ held at POSCO P&S Tower on Dec. 18th, the Ministry of Science, Technology and Information and Korea Internet Information Agency (KISA) announced the results of the research on the regulation improvement issues that impede the spread of blockchain technology. The study group, which has been operated since September, is composed of professors, lawyers, and industry workers who have expertise in blockchain technology and relevant laws and regulations. Moon Sung Hyun of Xblocksystems also joined as a consultant. Based on the industry meetings and surveys, the five carefully selected major regulatory improvements were discussed in depth during the nine sessions of the study group. At the ‘Blockchain Tech Biz Conference’, research results of the research heads based on 5 discussion topics were discussed. And Q&A session was held afterwards. The Ministry of Science and Information and Communication emphasized that it is important for new technologies like blockchain to find out and anticipate regulatory issues in advance in consideration of development stage and competitiveness. The Ministry announced that it will review the regulations in various fields comprehensively.